On November 27th one of the most amazing weeks of my life to date was about to begin. After sitting in a plane for 13 hours I finally arrived at Tokyo Narita airport, Japan. Mr. Yokoi and Mr. Urata, who also visited the Bussum fair in the Netherlands this year, were already waiting for me when I got out of the gate and together we drove to the hotel I was staying. This was a ride never to forget. The first impressions of Japan, toll-gates opening just before the car was about to (not) crash in to them, my first Japanese 'Miracle Drink' and many impressive buildings, especially the sight off the Rainbow Bridge was astonishing. When we arrived at the Hotel, Bernard Lamers (a Dutch MSX user who lives in Japan) was already waiting for us. I went to my room and took a shower, after which I returned to Bernard, Yokoi and Urata. We had diner and coffee in the luxurious Roppongi area. Also there is an article on Uzix, the Brazilian UNIX clone for MSX and a large article on MSX in the Netherlands, Spain and Brazil. Furthermore the magazine contains information on the MSXPC, the MSX Game Reader, the MSX turboR, various comics, interviews and tutorials. All in all the magazine looks very professional, just like MSX Magazine 1, released a year earlier. On another day we visited other impressive locations like Akihabara, where we had a look in one of the shops where MSX hardware and software is sold and the headquarters of MSX-Association, where I got to shake hands with Mr. Kazuhiko Nishi, and where I had a quick peek at the fifth floor, where many MSX collectors items (like MSX1, MSX2, MSX2+ and MSX turboR prototypes, books on MSX, software etc.) are stored. The day before MSX Magazine Matsuri I was asked to install openMSX on a Lindows PC, which was to be used to demonstrate Guru Logic on the festival the next day. Guru Logic is an MSX game created by members of TNI, TeddyWareZ and MSX Resource Center, based on the 2001 Gameboy Advance game GuruLogiChamp, which was released by Compile. It took me a while to get things going, but it was a nice way to contribute to the MSX Magazine Matsuri as well. The next morning Bernard picked me up at my hotel. Together we went to Akihabara. We were a bit early, so we decided to get some coffee and visit an MSX shop. Here, I bought a good-looking copy of Road Fighter and Tetris. After booting the computer that ran openMSX and Guru Logic I walked around the room where an incredible amount of MSX Computers were on display. The wall with MSX Magazines was equally impressive. Several modern notebooks and PDAs were demonstrating the capabilities of MSXPLAYer while an MSXPC connected to a Game Reader showed how easily it could run Hydlide 3. Apart from Guru Logic another new game was announced and demonstrated. 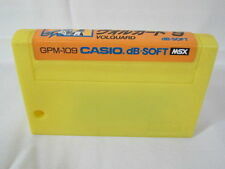 This game uses the MSX-Audio so that you can hear samples during the game. I was told that real (manga) voice actors were hired for this game. It looked and sounded very good indeed. The people of First Class Management were demonstrating the MSX-BASIC for Robo-Education package. They had taken a very simple 'robot' with them, to show that teachers could make their own robots with only little efforts. Essential item in this system is the P-Con box. With this box you can connect LEDs and the Robots in various ways, changing their functionality. An entire MSX-BASIC for Robo-Education package consists out of the P-Con box, a motor and sensor to create your own robot, a teachers' manual and a student manual. Total costs of this set are about 80 euro's, which is a very low price compared to the alternative educational systems. Currently about 25 schools in Japan use the MSX-BASIC for Robo Education system and they are very satisfied with it. It is very likely that First Class Management will sell quite a lot of Robo Education sets in the first months of 2004, just before the beginning of the new (Japanese) school year. In the lecture room the lecture of Mr. Kazuhiko Nishi had already started. His lecture started with information on the one-chip-MSX. Basically they have not changed much since the announcement in Tilburg 2001. Creating a low-cost device based on FPGA which is capable of connecting to the internet and translating UNL to various languages is still the key issue. The one-chip machine will probably not be running IntentOS however. At the moment Nishi is thinking of running an embedded, 'minimal' configuration of Linux, especially adapted to the hardware of the one-chip machine. Of course, the MSX Resource Center will keep you up to date of the latest developments in this interesting project. As in his Tilburg lecture, Nishi often went off-topic leading to various humorous situations. At a point he told the audience he always opened electronical products he had just bought, just to see what's inside. However, many new products break down by just doing that. Therefor he's a regular customer at a local hardware repair shop, who already started greeting him with "Don't tell me you opened it up again!". He also commented on the marketing strategies of Microsoft. "Take the X-Box. Microsoft have spent billions of dollars to promote the machine. Looking at the sales figures, they would have been better off giving those machines away for free!". All in all it was a very entertaining and interesting lecture, even though I did not understand most of it. After Nishi's lecture I briefly went to the building of Hirose Radio where the stand-holders of MSX Waku Waku Park were now putting up their stands. Over here, Bernard and I could leave our bags at the stand of Primitive Sound which was a great relief. We had little time to stay on the Waku Waku Park room however, as I was supposed to appear in a talk show together with Mr. Niitani (former president of Compile, now president of Aiky) on MSX Magazine Matsuri. Before the talk show I had the chance to have a brief conversation with Mr. Niitani. Since Mr. Yokoi (who was hosting the talk show) was already announcing us we agreed to meet again afterwards. The talk show itself was a very fun thing to do. Of course, I didn’t (and still don't) speak Japanese at all. Bernard Lamers offered his services and translated all I said to Japanese, and all I needed to know from Japanese to Dutch. It took a little while until we got used to these translation-stops, but in a way they added to the relaxed atmosphere. During the talk show we discussed Compile, MSX in Europe, MSX Resource Center, Aiky's point of view to foreign developers and Guru Logic. Mr. Niitani praised the MSX version of Guru Logic. It is very likely that the game will be released by Aiky when it is finished. After the talk show someone even approached us to ask for our signatures. Mr. Niitani drew a genuine carbuncle in no-time. Backstage we met Mr. Niitani again and we discussed several things in the little time we had. He explained that Aiky is a combination of several words, expressing 'a feeling of love for creating games'. When I mentioned the Compile games Zanac and Aleste 2 had reached the third place in the 'What is the best MSX1 game ever' and 'What is the best MSX2 game ever' competitions, he told me that he had already seen it himself on our website and that he was very pleased with these results. The rest of the day I spent most time at MSX Waku Waku park. On MSX Magazine Matsuri there were ongoing lectures and talkshows, the sales of MSX Merchandize (now also available on the ASCII MSX Store) and, of course, MSX Magazine 1 and 2, which were all selling very well during the day. The price winners of the MSX-BASIC programming contest were announced as well. These games are now available for download on the MSX Association website and were also published on MSX Magazine 2. I highly recommend playing the winner, in which the objective is to fill as many tires of bicycles with air as possible. On the third floor of AsoBitCity, in their bookstore, there were huge piles of MSX Magazines and throughout the day many people were looking at them and buying them. A very strange experience to see MSX books in these amounts in the shops today. All in all I had an exceptionally great time in Japan. If you ever have the opportunity to go there, you surely must do so. If you can combine it with some MSX Activities (like visiting an MSX fair or user meeting) it's even better. It was very nice to meet some of the people who are making the MSX Revival happen in Japan. When I get to visit Japan for a second time, I will make sure I can stay there a bit longer. 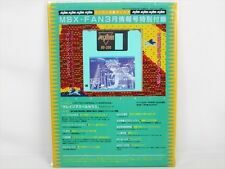 You can also have a look at the Nippon 2003 photoshoot, or look at the pictures I took of the computers that were on display on MSX Magazine Matsuri right here.